A great place to start a shopping spree throughout Kentucky is at A Taste of Kentucky, located in downtown Louisville, where visitors will find arts and crafts made by Kentucky artisans, as well as various other Kentucky souvenirs and tasty treats, including Derby Pie and Bourbon Balls. Also located in downtown Louisville is Regalo, where visitors will find reasonably priced gifts ranging from unique picture frames to bourbon bottle clocks. In Lexington is Woodland Triangle, a cluster of 13 shops where attendees can find gifts that include jewelry, purses, soaps and University of Kentucky items. About 40 minutes from Lexington in Frankfort, Ky., is Buffalo Trace Distillery, where groups can take a tour, enjoy bourbon tastings and browse the on-site gift shop for take-home goodies, including bourbon products (spirits and food), T-shirts, bar items, glassware, candles and novelty items. It’s worth noting that Buffalo Trace Distillery is also available for private group gatherings. Among the event spaces here is a clubhouse that accommodates up to 350 people and the Master Distiller’s Room, a smaller space with a fireplace that’s best suited for board meetings or meal functions for up to 16 people. All the candles found at downtown Bowling Green’s Candle Makers on the Square are hand-poured on-site, and there are over 70 fragrances to choose from. Scented lotions, soaps and gift baskets are also available. In Northern Kentucky, groups will find the Covington-based Donna Salyers’ Fabulous Furs, a faux fur purveyor that boasts a place on “Oprah’s Favorite Things” list. 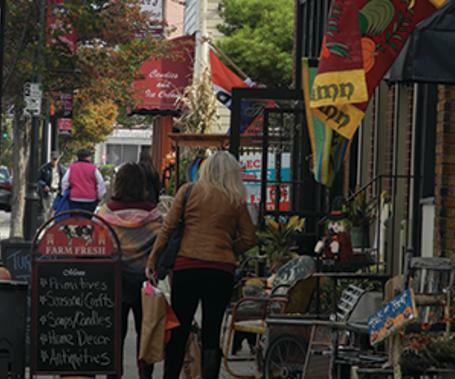 Also at home in Northern Kentucky is Bellevue, Ky.-based Fairfield Avenue, a quaint historic district known for its diverse collection of shops featuring everything from handmade furniture and chocolates to custom jewelry and antiques. And in Paducah, which is recognized as a UNESCO Creative City of Crafts & Folk Art, is Bricolage Art Collective, a downtown art gallery that sells works by regional artisans Read more from MeetingsToday.